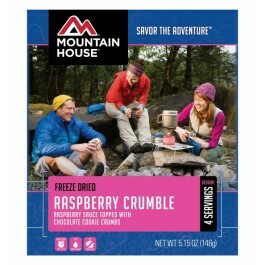 Mountain House has created this delicious raspberry crumble desert that can last for over twenty years on the shelf. It was designed specifically to not only last a long time on the shelf, but also taste great when you do finally open it. The majority of these items are ordered to add to an emergency food storage program, or other type of food stockpile. Of course, some people love to bring them along while hiking in the great outdoors or traveling, because they are such a convenient way to bring a snack with you anywhere you’re going. 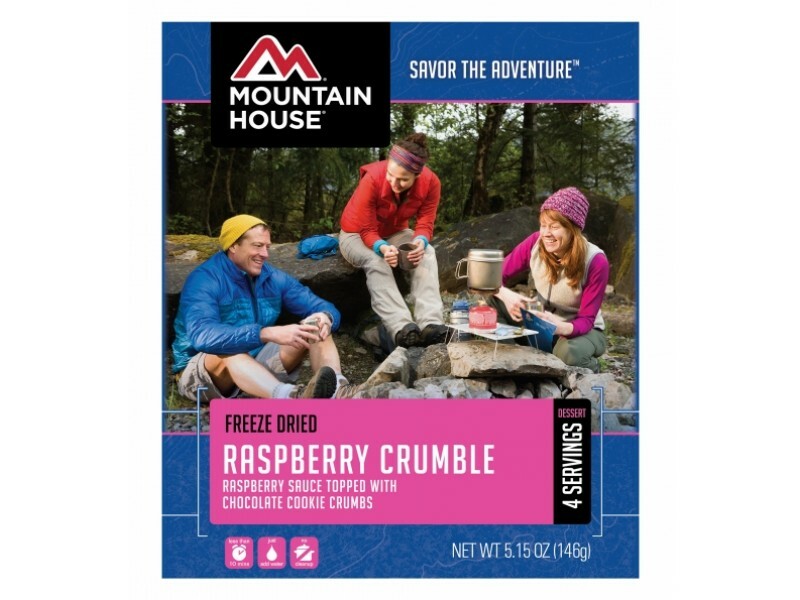 This raspberry crumble from Mountain House is a popular long term storage dessert option for all types of people. Each order comes with one pouch, containing four full ½ cup servings, which makes it perfect for couples or even small families. Preparation is extremely quick and easy, allowing you to pull it out and enjoy it almost anywhere. Each serving has 160 calories, 2.5 grams of fat, 1 gram of protein and 20 grams of sugar, which will help fuel you to keep going in almost any situation. Like all emergency foods, this one provides you with the energy you’ll need. Whether you’re packing away food just for yourself, or you need to feed an entire family, this item is an affordable, great tasting treat to complement any meal. Adults and children alike enjoy the sweet taste, making it a very popular option. No matter what types of situations you’re preparing for, it is always good to have a large variety of different types of food available. Adding this raspberry crumble will give you and your family additional options to choose from, and something that everyone will enjoy. 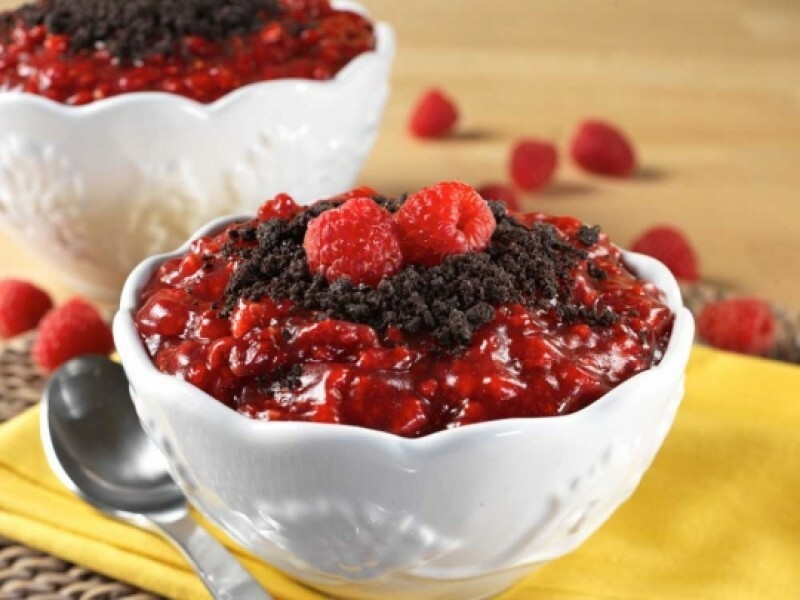 INGREDIENTS: RASPBERRY SAUCE MIX: Sugar, Freeze Dried Raspberries, Modified Corn Starch, Nonfat Dry Milk, and Corn Oil. CHOCOLATE COOKIE CRUMBS: Sugar, Enriched Flour (wheat flour, niacin, reduced iron, thiamine mononitrate, riboflavin, folic acid), Partially Hydrogenated Soybean Oil, Cocoa Processed with Alkali, High Fructose Corn Syrup, Corn Starch, Baking Soda, Salt, Soy Lecithin, Vanillin (an artificial flavor), Chocolate, and Whey. CONTAINS: Milk, Wheat, Soy. 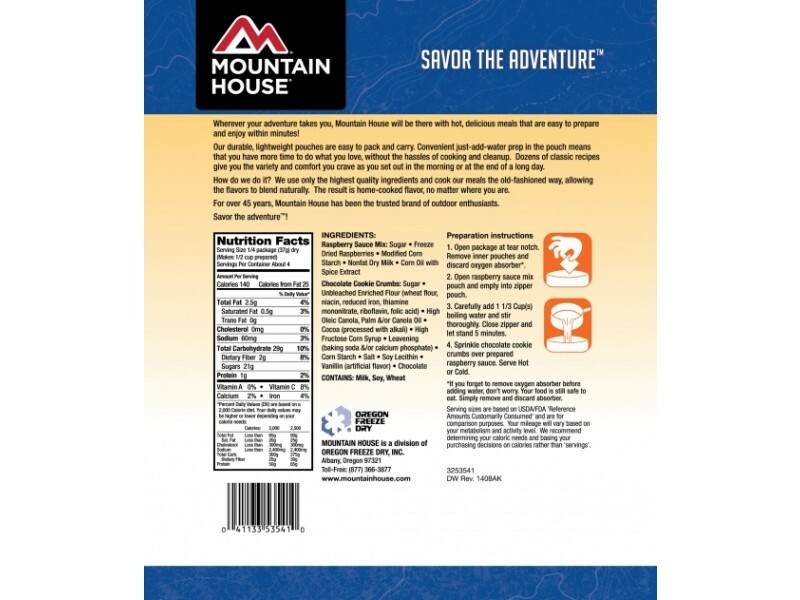 One pouch contains 4 1/2 cup servings.